Charlton Cyril Mason was born in 1886 at West Mersea. His father and mother were George Mason (born in Brightlingsea and brought up at Moverons Farm) and Susannah Skipper but his mother died young when Charlton was only a baby. His father then married, Elizabeth Siles, in approximately 1889. Elizabeth appears in the 1891 census living with the family as the housekeeper. Charlton is 5 and the address given is West Mersea Road. Interestingly Elizabeth is from Norfolk and in later years the Masons' house goes under the name of Norfolk Cottage. Through the censuses we see that Charlton's father is a farmer in 1901 at 'Masons Farm' Peldon and Charlton is a Grocers' apprentice. By now George and Elizabeth have nine children. In 1911 (where George is the census enumerator for Peldon) the family is listed as living at Ives Farm, Peldon, and George is a Farmer and Poultry dealer. In WW1 Charlton was on the SS Euterpe which was a liner of 2270 tons, built in 1886. It was sunk on 11th August 1916 by Italian Submarine SMG-F-7. SS Euterpe was being used as a troop ship and c 453 were lost and 450 saved including Charlton. In 1918 he is on the Absent Voters Register and is described as Merchant engineer on HMT BRAMBLELEAF. In 1919 his name appears on the Absent Voters Register his address is given as Strood Villa [Pyefleet House] and he is described as a Merchant Engineer on the SS Euterpe [out-of-date because the Euterpe was sunk in 1916]. On the register of electors in 1921 he is living with his family at Strood Villa. In 1932 we find him returning to Southampton from New York on board the SS Bremen arriving on 17th November 1932. His occupation is that of engineer, he is 45 and his address is given as Norfolk Cottage, Peldon, Essex. The next we hear of him is in 1941 in the local newspaper where despite his age, 55, he is again on war service on board a Merchant Ship, this time, 3rd Engineer Officer on SS TEMPLE MOAT. MISSING AT SEA The shipping office has reported that Second Engineer (Merchant Navy) Officer Charlton Cyril Mason second son of the late George Mason of Peldon must be presumed lost at sea. Engineer Mason had a lucky escape round Narvik but lost all belongings there. He was afterwards taken prisoner by the French in Algiers and was six months in captivity, but was finally released and sent to Gibraltar, joining his ship in January 1941. He afterwards left for America. That trip at the beginning of 1941 on board the TEMPLE MOAT was to be his last. The TEMPLE MOAT was a Merchant Navy vessel en route from Blyth to Buenos Aires carrying 6,130 tons of coal. It was part of the convoy, OB288, but had been dispersed. At 01.45 hours on 24th February 1941 the ship was hit by one torpedo from the U boat U-95 and sank fast by the bow about 240 miles south of Iceland (59° 27'N, 20° 20'W - Grid AL 2331). The master, Thomas Ludlow MBE, 39 crew members and two gunners were lost. Charlton's probate was administered by his married sister, Gladys Pullen. Charlton Cyril Mason's name appears on the Tower Hill Memorial to men of the Merchant Navy and Fishing Fleets who gave their lives and have no grave but the sea. It is clear his family were immersed in village life, his father George was clerk to the Peldon Parish Council from 1894 to just before his death in 1936. On George's behalf his son Arthur Blackwell Theobald Mason accepted a presentation from the Parish Council and stepped into George's position. George Mason was to die on 25th November in 1936. There is no memorial in St Mary's Church to his son Charlton, nor the other three who died in World War 2. Is it not time that, as Peldon's vicar wrote in 1946, there should be a plaque in the church? It is hoped to place a suitable plaque in the church to the above. 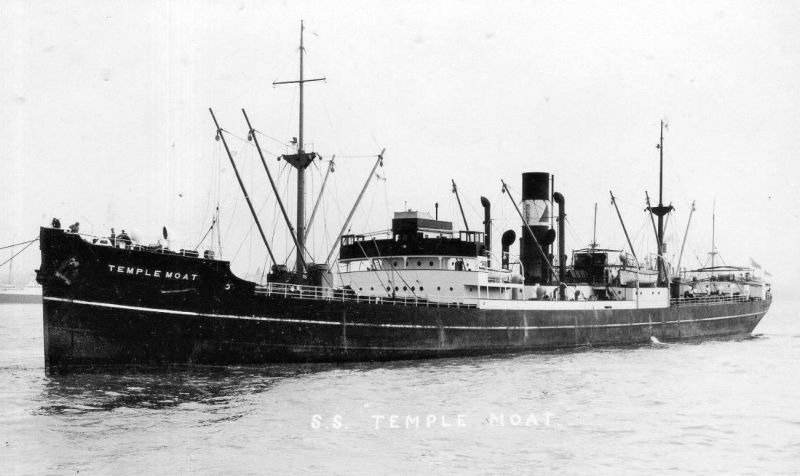 TEMPLE MOAT was a tramp cargo ship of 4,427 tons gross, Official No. 160481, built in 1928, and operated by Lambert Brothers. She was sunk by U95 south of Iceland on 24 February 1941, with the loss of all on board. The Third Engineer on board was Charlton Cyril Mason (sometimes Charles Mason) who was born in Mersea and lived in Peldon for much of his life. See WW2_CCM . There is a more detailed article on the TEMPLE MOAT on www.fourmarksnews.co.uk/addendum.pdf.